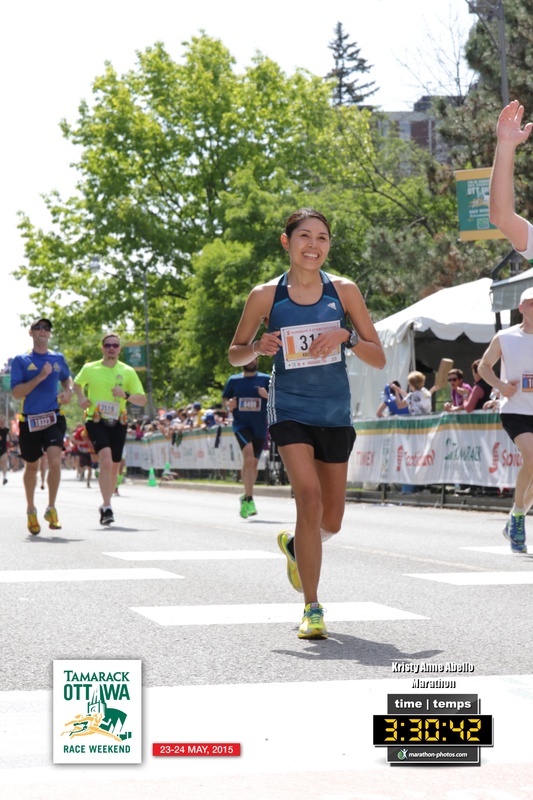 Last Sunday I achieved a dream — running a Boston Qualifying (BQ) marathon. 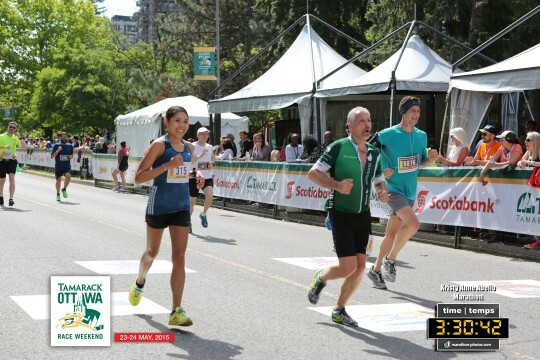 l clocked in at 3:30 hours during the Scotiabank Ottawa Marathon. The achievement surprised me because I’ve always been a recreational runner whose consistent running goal is just to keep fit. Training for this race and meeting the Boston qualifying time was a jump into being truly “serious” at running. The journey started last January with the decision to commit to the training. I figured that the price to achieve the dream was something I can pay. True enough, the training was nothing I’ve done in the past…. new elements, a more holistic program and a totally new level of commitment. 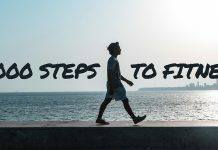 Here I share the key components of the training, specifically the ones that l felt contributed most to reaching the target. I had the privilege and honor to have Jim Lafferty as my coach. He is the real deal… he is not only certified to train athletes, he also has a track record for producing successful marathoners. This is why listening to him was the cornerstone of my BQ story. The bottom line is that I don’t know much about running a 3:30-hour race. While there are a million tips on the internet, I felt that I needed to have someone who knew what he was talking about. And I trust Jim. In 2008, I listened to one of his talks where he convinced us that anyone can run a marathon. I believed him — hook, line and sinker. Four months later, during the Milo Metro Manila 2008 Eliminations, I ran my first marathon in 5:50 hours. Then over the course of ~6 years, Jim and I improved my marathon time to 5:00 hours in 2009…. then 4:30 hours in 2010… then 3:58 hours in 2011. I know I can count on Jim. He trains Olympic athletes, and knows what he is talking about. (I continue to be very cautious about listening to self-proclaimed coaches out there who pretend they are qualified to coach because they’ve run a few fast races or ran five marathons). Moreover, Jim understands the pressures of balancing a P&G day job and trying to meet tough training objectives. Training for a BQ meant putting FULL TRUST on the person who knows more than I do. I value Jim’s experience and perspective as an American coach because his standards are higher. He knows what it takes to run a 3:30-hour race – mileage, diet, strength training. He is not afraid to challenge the things that I was used to that contradict our end-goal (like eating rice, or avoiding abs exercises). My fastest race prior to starting the BQ Training was Milo 2011 at 3:58 hours. This was followed by a “chill” race during the 2013 Singapore marathon where I clocked 4:16 hours. When I started the training, I was VERY FAR from a 3:30-level, and was officially in “come-back” mode because I had a surgery in April 2014. Net, Jim and I needed to make a 30-40 minute improvement to reach the target. Jim’s advice was to break it down into more achievable segments. 10 minutes – can be achieved by simply running a better race course. It is very difficult to run a Boston Qualifying marathon in Manila where one needs to struggle with 30-degree temperatures, humidity, pollution, traffic, and sub-par race support. 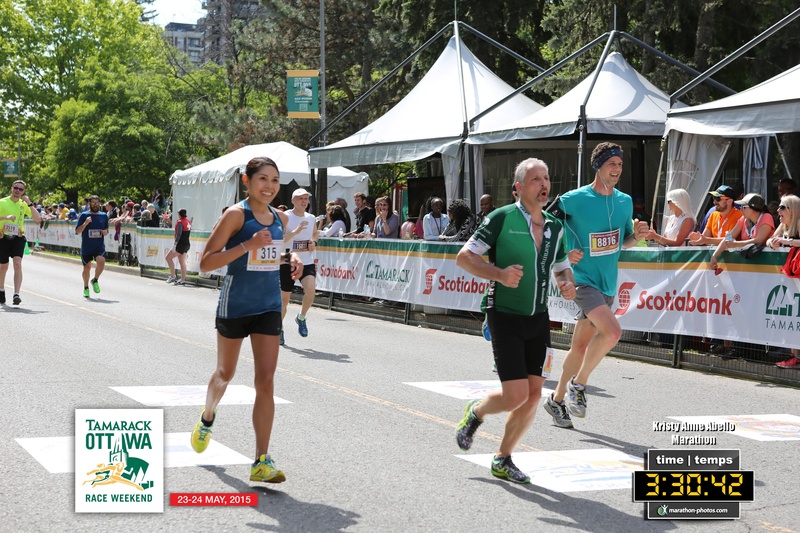 And so we chose the Ottawa marathon because of factors that would support a BQ time: (a) temperature of 12-16 degrees which is optimal for running, (b) flat course (c) good race logistics based on International Standards. 10 minutes – can be achieved via training. The core of my program looks like any other marathon training. It is a mix of long runs during the weekends, 1-2 speed drills during the weekdays, and a couple of recovery runs. There is nothing new or crazy about my training plan. If anything, we focused on the speed training because I am not a naturally fast runner. We had to correct my form and make sure that I am comfortable with faster paces. 10 minutes – can be achieved via body composition. What I learned is that every kilo of body fat is effort for the body. When the fat is taken off, you run faster. Simple. Running to weight has a linear correlation…. reduce body fat 4% and speed goes up +4%. In a marathon, 4% means 9-10 minutes faster. When the training started in January, I was 116 lbs. with 16% body fat. Three days prior to the race I was down to 109 lbs. with 12% body fat. Marathon training is a commitment, and I took the commitment seriously. My training plan is nothing special. There is no trick or magic training in the plan that cannot be found in running books or websites. The key elements are the same – good mileage of 70-80 KMs per week, interval runs (the Puke Sessions), tempo runs, and progression runs. I ran five to six days in a week. My mileage was even lower than the average 3:30-hour runner, but Jim and I focused on having quality workouts. Marathon training is about hitting the target each day and each week for 18 weeks. When the long run needs to be 24KMs then I do 24KMs and not 23.8KMs. When the tempo run is 3X4KMs @ 5:00 pace, then I do it at 5:00 pace. When the intervals need to be 10X800 @ 3:20 minutes with three minutes rest in between, then I do it exactly as planned. Down to the exact number of minutes that I need to rest. Then I share results to Jim week on week so that he can monitor my progress. There is no point in cheating because your body will know it anyway. I did this for eighteen weeks. It was a daily demand to do my best at each and every run, whether the workout was easy or difficult, whether it was sunny or raining, whether I felt like it or not. It was eighteen weeks of consistency and grit, with a shake of perseverance. The diet of Philippine Olympic long jumper Marestella Torres is not a secret (most especially because she is also coached by Jim Lafferty). Her diet consists of 2g protein per kg body weight, lots of vegetables and only healthy carbs for energy. This diet was shared in the Pukers Running Team FB group in early 2014. I followed this diet to reach the body composition target. This was the most difficult aspect of the training. I love(d) cake and chocolate. My favorite pastime was drinking a cup of black coffee and eating a slice of cake (or two!) with music in the background. I was used to eating simple carbohydrates during main meals (white rice, bread) and snacks (pastries, kakanin, and good old banana-Q). But to reach the target, I needed to intentionally replace these foods with healthier options. Lettuce or quinoa instead of rice. Egg whites or a protein shake instead of a pastry or a slice of kakanin. It was a sacrifice. It was also difficult because of the social component of eating. Filipinos eat out when we are with friends and family… and it is challenging when healthy options are unavailable, or when your dinner companions look at you strangely for your food choices. I also augmented my diet with some supplements. My body took a beating for five months in preparation for the race, and it was important to ensure it received proper nutrients. So I started to take multi-vitamins, anti-oxidant and essential fatty acids (EFA) supplements to make sure I don’t crash. One key change I made was complementing my running with strengthening exercises, which I have never done in the past. I started doing pushups, using the ab rollers, and working out my upper body. Not only will these make me stronger, they also contribute to burning my excess fat. The secret was to do these exercises at home. Since I am working full time, there was absolutely no way for me to insert gym visits to my already-crazy running routine. So I bought weights and other tools to help me do the exercises at home. As many of you know, I struggle with Illiotibial Band Syndrome (ITBS) which I first got in 2008. Multiple times during the training, my ITB became inflamed and the pain had to be managed. We did this via the old-fashioned way – stretching! I had the privilege of knowing Carol Lee who taught me the basics of yoga stretching which I did not know in the past. Carol also teaches the same stretches to the Pukers during our regular runs, but she added a few more stretches for me to manage the ITB tightness. And so I would do the stretches before and after each run. At the height of my ITB pain, I would perform the stretches again in the evenings. What most people do not realize is that there are multiple components to physical fitness, and excelling in one is often insufficient. So I decided that I will try to be excellent in all three – cardiovascular fitness, strength and flexibility. I might not be able to be best in all, but any effort must count right? As a result, my ITB slowly and consistently went away (although we kept a close eye on it throughout the training). There were several challenges that I had to overcome during the training. Each one had to be dealt with (and with loads of positivity!) to achieve the target. The first challenge is my schedule. I work full time and needed to find ways to fit my exercise schedule. I maximized our company’s flex-hours, especially because I had a lot of night meetings. I also dropped non-essential activities that were not part of my life priorities. The second challenge was the Manila heat. I went through the most brutal long runs right smack in the middle of Philippine summertime. The first thing I did was to run VERY early. I would wake up at the crack of dawn to run in reasonable temperatures. All runs need to finish by 7:30 AM max, or else I would be dehydrated and fried to a crisp. Occasionally I would use the treadmill, especially if my night meetings are unreasonably late. There are so many better runners than me, many of them are in the Pukers Running Team. Even if you ask Coach Jim, many of the Pukers can beat me ANY DAY at sprinting or in running form or in power. And so what I did was to quietly observe them, talk to them, and learn from them. I learn from Jessie’s excellent running stride… from Vince’s competitiveness and focus… from Dennis’ holistic training including the discipline to diet… from Jonathan’s grit and determination… from Joey’s fearlessness in taking on hard workouts… from Ken’s energy in rallying support for a vision… from Tanya’s will to succeed despite injury… from Adel’s quiet determination to put meet the weekly mileage… from Marc’s consistency for improvement…. from Aimee’s positivity despite difficulty. My friends might not know it, but they have always been part of my BQ training. The best-kept secret to the BQ journey is to surround myself with people who support my dream. I get motivation and energy from my friends, and most especially from my running team (the Pukers!). Pursuing a difficult target becomes much easier when you are surrounded with like-minded individuals who are also in the same journey, who encourage you, and who believe in you. Running with friends makes the training more enjoyable. There is no stress during the long runs when it is laced with good conversations and light-hearted banter. There is a high in going all out on a speed drill when your friends are doing the same (and competing with you!). There is delight in ending each run with a good, hearty breakfast. There is happiness in building lasting friendships that extend beyond just running. Because of my friends and running team, the five months flew by. Difficult, but not impossible. Kristy is a full time IT Manager in Procter & Gamble. She started running eight years ago as part of P&G’s Wellness initiatives and discovered that she liked it so much. She ran her first 42KM in 2008 with a time of 5:54, and years later, ran her best 42KM in 3:30 hours. She qualified for the Boston Marathon and ran it on April 2016. Her recent wins include 1st place in the Nat Geo 21KM Category (2015), 1st place PF 21KM Sub-2 Challenge (2015), 4th place in the National Milo Finals 21KM (2015), and 3rd Place in Cebu Marathon 21KM Category (2016). Kristy is part of the Alabang Pukers running team. You can see her running around the Makati or BGC area at 5:30-7:00AM. Working on BQ this year! Thanks for the lovely story and for the pointers!! !